This article will cover the interaction tool that we use to build Fragments of Him. This tool has seen several iterations before arriving at its current state. When we started building Fragments of Him, one of the questions we asked was “How can we easily implement content and gameplay without writing a lot of custom code”. Back then, the answer was pretty simple. We write a custom interaction tool. Creating interactions in the editor. Not only did it look very messy, it would require quite a bit of overhead in thinking of all the little quirks in the tool to implement an interaction. 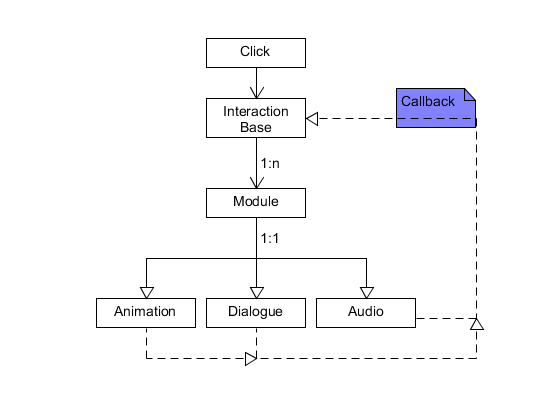 In more complex cases, we needed to trigger multiple animations, with several pieces of audio, play the accompanying dialogue audio and then indicate what interaction is next. Instead of trying to fix the tool we had, we opted to create a new version instead. This new version should be faster to use and be more dynamic. That seemed fairly simple and formed the starting point. We developed a couple of the basic modules to test out the callback system and gave it a whirl. While testing, we still used the inspector to drag in all the scripts and variables. While this isn’t too bad of a solution, it doesn’t give us any overview of the entire system. 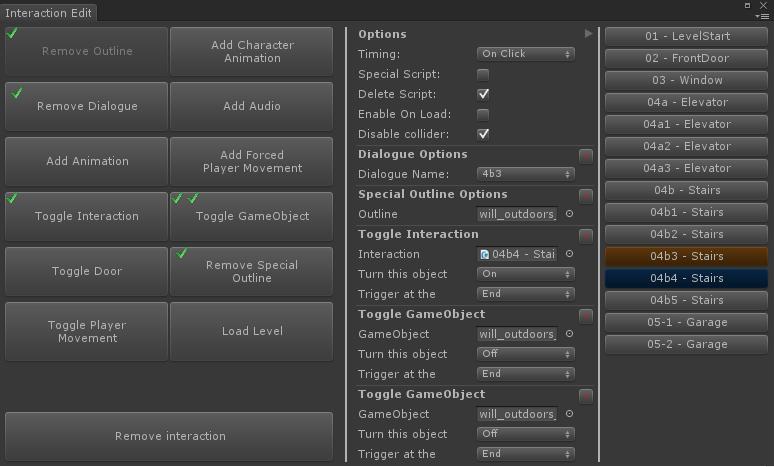 We figured that developing an interface around the new interaction editor would give us the overview we wanted. Interaction Editor. All possible modules are on the left, currently added modules & parameters on the right. 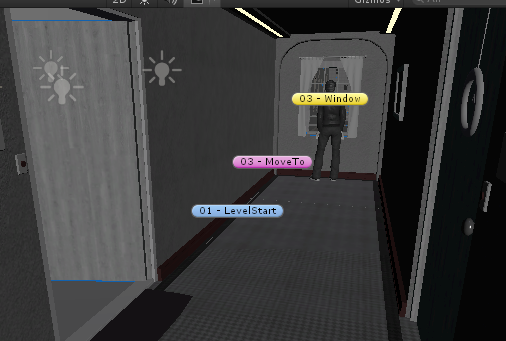 To indicate where all these interactions take place we use the Unity’s colored icons. This makes it easy to identify where an interaction takes place. Additionally, it also makes it easier to find an interaction when looking for one in the scene. Sometimes we would forget to add an icon to an interaction and that could get confusing pretty quickly. Not only do we now automatically add an icon when creating an interaction, we also create and update a list that keeps track of all the interactions in the scene. To modify an interaction before this new tool, we had to find the interaction in the scene hierarchy or click on the icon in the scene if we thought of adding it. That turned out to be very frustrating and inefficient when trying to quickly check multiple interactions in a scene. 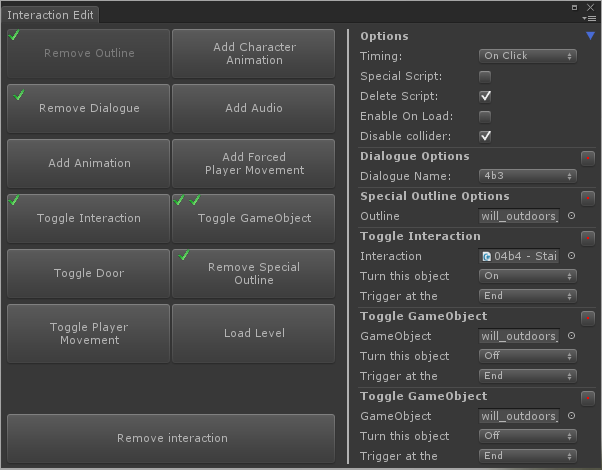 The solution to this was to add a list to the interaction editor that keeps track of all the interactions in a scene. The currently selected interaction is coloured brown, the interactions that will enable after completing the interaction are marked as blue. With our first (old) interaction tool, we spent a couple of days trying to get all the interactions in the first scenes (while adding features in meantime). This resulted into a lot of workarounds that were needed to get around limitations. The new system took a week (give or take) to build, and instead of spending a day to put in interactions, we can now do the same amount of implementation in roughly 2 hours.